CALLING DR. GILLESPIE (1942) continues MGM's long-running Dr. Kildare series, minus Dr. Kildare. 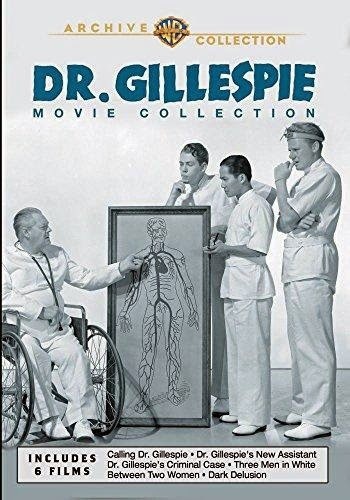 It's part of the six-film Dr. Gillespie Movie Collection, available on DVD from the Warner Archive. 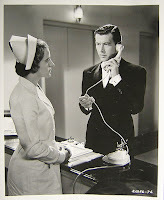 Over the last few months I've enjoyed watching the nine films in the Warner Archive's Dr. Kildare Movie Collection, with Lew Ayres as Dr. Kildare. 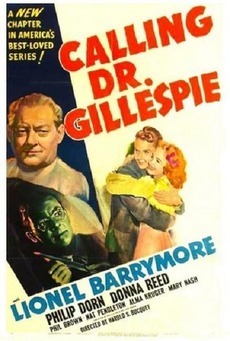 Ayres' role in the series ended with DR. KILDARE'S VICTORY (1942). After DR. KILDARE'S VICTORY and FINGERS AT THE WINDOW (1942), which costarred his KILDARE leading lady, Laraine Day, Ayres was off the screen for the duration of WWII, returning in THE DARK MIRROR (1946). Although initially there was a flap about Ayres declaring himself a conscientious objector, he ultimately served in the war as both a medic and as a chaplain's assistant. Meanwhile back at Blair General Hospital, the series would continue without Ayres for another six films, spread over half a decade. All of the films continued to star Lionel Barrymore as crochety Dr. Leonard Gillespie, with the first of the films being CALLING DR. GILLESPIE. In this entry Dr. Gillespie is mentoring a young surgeon (Philip Dorn) who's interested in changing his practice to psychiatry. Dorn, who might be best-known as Papa in I REMEMBER MAMA (1948), is on the dull side in this, but the film is brightened by the presence of the young Donna Reed, not to mention many of the Kildare series regulars. Reed plays Marsha Bradburn, a young lady at a girls' boarding school run by Gillespie's old friend Emma Hope (Mary Nash). Marsha receives permission from her father to become engaged to Roy Todwell (Phil Brown), but when Roy learns Marsha's father insists she finish school before the wedding, Roy promptly picks up a rock and kills his dog. It's a startling and disturbing moment. Roy veers back and forth between normalcy and increasingly prolonged periods of insanity, leading Dr. Gillespie and his colleagues to do a lot of exclaiming about him potentially being a "homicidal maniac"! (Some of the psychological theories espoused in the film are "interesting," to say the least.) Eventually Roy ends up on the loose in Blair General Hospital, gunning for Dr. Gillespie. Needless to say, Marsha's engagement doesn't turn out so well. It's a relatively silly episode in the series history, but I nonetheless found it entertaining company. Reed is sweet and lovely, and it's always enjoyable spending time with the Blair Hospital regulars, who in this entry include Alma Kruger, Nell Craig, Walter Kingsford, Nat Pendleton, Marie Blake, Eddie Acuff, and Barbara Bedford. One of the really fun scenes occurs at the very end, when Dr. Gillespie attends Marsha's graduation. The incredibly gorgeous young woman sitting next to Marsha is Ava Gardner, one of over two dozen bit roles she played in her early years at MGM. 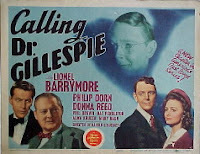 CALLING DR. GILLESPIE was directed by longtime series director Harold S. Buquet, returning to the series after taking time off from DR. KILDARE'S VICTORY. It was filmed by Ray June. The Warner Archive DVD has a couple of scenes which are noticeably speckled, but for the most part the print and sound quality are perfectly fine. The disc includes the trailer. The next four films in the series feature Van Johnson as a young doctor, with James Craig a doctor in the final film; Keye Luke also appears as a doctor in the remaining five Dr. Gillespie films. Look for more Dr. Gillespie series reviews here in the future.